What are Twin Flames Gem Elixirs? Physical imbalances and dis-eases result when we lose our awareness, become disassociated from others or disconnected from our life purpose. Essences are pioneering remedies that embrace the principles of vibrational medicine that all illness, disease, or imbalance is characterized by blockage in the channels on some level: either in the chakras, meridians, arteries, veins, lymph or nerves. When there is a blockage in a channel, the related system or organ no longer vibrates at a healthy frequency, causing discomfort or sickness. Vibrational essences restore the healthy vibration to the etheric body allowing the physical body to rebalance itself. Every individual who works to raise his or her vibrational level to enter into a clear and balanced frequency is contributing to the alignment and enrichment of this world. ﻿All crystals stabilize and balance the energy field and the subtle bodies of the aura and the chakras. Gem elixirs work by catalyzing the release of stress and tension that have built up in the energetic structure of the body. As the dissonant energies are released, structure comes back into alignment and the body regains its natural state of balance, stability and resistance to stress. Gem elixirs help us access the healing support of the mineral kingdom in a very efficient way through their ease and flexibility of application. They may be used both internally and externally, by themselves, or in combination with other vibrational remedies. Twin Flame Gem Elixirs are two elixrs made during two distinctly different energetic moments within a 24 hour period and then blended together to create a synergistic, potent and vibrant gem elixir that will effect all PEMS (physical/emotional/mental/spiritual) levels of your being. Each elixir is shipped in a one oz amber glass bottle with a glass dropper and an spray attachment along with an Ingredients and Usage booklet or scroll in an organza gift bag. Become more conscious and more compassionate for others, for the Earth, for devas and for subtle energies. When we touch those issues that have been repressed regarding times that compassion was denied us, we lose touch with how deep our own compassion runs... maybe not as deep as we would like. There will be an inner awareness of love, a sense of purpose, an inter-connectivity to other beings, other life streams, a recognition of similarities and awareness of the many energies of nature, of life, of the principle of manifestation itself, and the understanding of Source/God/All That Is with the use of this elixir. Increase inner levels of compassion, self-forgiveness, and acceptance of the human condition, release the large reservoirs of energy that may have been stuck for many lifetimes and experience them in a healthy way. Experience an alignment of purpose of the heart and the mind and expand the possibilities of receiving compassion and love from higher vibrational levels than you have ever imagined. I accept that I am a deeply compassionate being. I accept that there is a place for this energy in the world. We all want an abundant life. Abundant loving relationships, abundant prosperity and abundant connection to Spirit. To accomplish this, our solar plexus chakra must be balanced for personal power, self-confidence, responsibility and will power, to be more aware of who we truly are and then show up in our life being that person. How do you digest your life? Are you fluid and flowing or are you stuck? A stuck solar plexus chakra will never draw in the abundant life you yearn for. The solar plexus chakra demands the truth of authenticity. It allows us to lead the way to our authentic self versus following someone else and being who they want us to be. It holds the energy of power and authority. The energy of the Lion. As we become more empowered by living our personal truth we inspire others to do the same. When the solar plexus is balanced, we’re magnetic to more abundance in our lives. I accept that I am a powerful being. I accept that there is a place for this energy in the world and abundance in all it’s forms flows to me effortlessly. IMPORTANT! If you are sensitive to metals and/or sulfur, please consider purchacing 11:11 Abundance instead. Under the SUN of August 8, 2018 and the energies of Sirius and Lion’s Gate peak, a superwave of energy travels through the Great Central Sun carrying “8” frequencies of personal authority, confidence, inner-strength, freedom, abundance and prosperity. The first alchemical components for Alchemy and Energy Twin Flame Gem Elixir, 8:8 Abundance, were alchemized in a crystal singing bowl with pure spring water and a prayer for clarity and stabilization. This gem elixir will also be very effective at anytime enhanced courage, energy and confidence are needed. The powerful 8-8 superwave helps transform physical dense matter into crystalline plasma particles...activating the Light Body. This is a sacred moment of potent abundance. Orange Calcite, Green Aventurine, Amber, Golden Healer Quartz, Tiger Eye, Citrine, Golden Calcite, Jade. Every year on July 26th, the sun, the earth, and the star Sirius move to specific points in the sky creating an opening between the physical and spiritual worlds. On the 8th of August, the alignment reaches its highest point, and this gateway is known as the “8:8 Lion’s Gate” due to it peaking on August 8th in Leo. Sirius rises each year during midsummer and is associated with new beginnings, new insights, new light, new awareness, and new thinking, and brings with it new levels of conscious awakening. The surge of light waves emanating from Sirius carry an influx of divine wisdom and advanced knowledge from higher realms (known as ascension light codes) that stream toward our planet, and when integrated through our energy field, are said to awaken our consciousness, and activate our DNA. It is thought that while this energy portal is open, the rays of Sirius come into our planet Earth and help accelerate our personal and spiritual evolution. The connection between Sirius and the sun intensifies this energy, as each radiates powerful, high vibrations. Earth has a brief and rare opportunity (known as a “star gate”) to absorb the energy from the two brightest and most supercharged celestial bodies in our sky. A star gate is a portal that allows rapid travel between dimensions of two distant locations in the universe. It is a time for life-altering and transformative happenings that encourage us to stop procrastinating and work rapidly toward our goals and dreams. It is known as a beneficial period whereby plans we have been trying to manifest for some time quickly and effortlessly become a reality. July and August are already highly transformational months due to the eclipse cycle that started on July 13th and is due to end on August 11th. Mercury also goes retrograde on the same day the Lion’s Gate doorway opens, it is the full moon eclipse the following day, and the accumulation of all of this energy will have a profound impact on us. Made with Golden Healer Quartz, Herkimer Diamond, Golden Calcite, Citrine, Obsidian, Bloodstone, Red Jasper, Brandberg Amethyst, Malachite, Gold and Feverfew flower. Use this Twin Flame Gem Elixir during eclipses and planetary retrogrades. Cleanses the unconscious mind and eases tension for emotional integration, inner peace, and sensitivity. Cleanses and circulates energy in the emotional body. Protects the aura, keeping it clear and balanced. Promotes intuitive wisdom. Reduces anxiety and stress. Activates inner resources to stabilize emotions. Enables access to the highest aspects of our personal identity, helping us tap into our inner truth, joy, and wisdom as a source of creative power. Cleanses the unconscious mind and eases nervous tension, anxiety, shock, and neurotic behavior patterns. Eclipse Sandwich Twin Flame Gem Elixir strengthens our perception of higher levels of reality and allows higher energies into the physical body by breaking up blockages in the etheric body, bringing order to chaos, increasing intuition and elevating mental achievement. It also provides purification, cleansing and elimination of physical and mental disorder. Made with Moonstone, Labradorite, Opal, Opalite, Gold, silver, Green Quartz, Citrine, Clear Quartz and Tiger Eye in pure spring water and perserved with 25% organic alcohol. Powered in Light LIfe Rings for 12 hours before shipping. We made new summer solstice elixir during the Solstice window! Solstice elixir is always the year's most powerful and potent elixir and with the help of the unique planetary and star energies above us this year, Summer Solstice 2018 Gem Elixir is our most unusual and potent gem elixir ever! On June 21st, the day of Summer Solstice was a cloudy, cooler and less active day. It was a beautifully relaxing top note to add to the base elixir. This infusion was alchemized in the root chakra crystal singing bowl beginning at noon with gold, watermelon tourmaline, smoky amethyst, citrine and carnelian were infused into the spring water. This elixir can reconnect people with nature and nature spirits. Personal transformation becomes more playful. Thanks to everyone who purchased Summer Solstice! It was a roaring success! The content of the bottle is 1 oz of Mother Essence (ME), meaning the elixir is the undiluted solution of the crystals in spring water bathed under the sun, moon & stars, with the addition of organic vodka as a stabilizer & preservative. The contents of most gem elixirs we purchase are known as Stock Bottle (SB), made by putting a few drops of the Mother Essence into a bottle of brandy & water (or vinegar & water) and succussing (shaking) it. This is what you usually find for sale. There are approximately 800 drops in 1 oz. 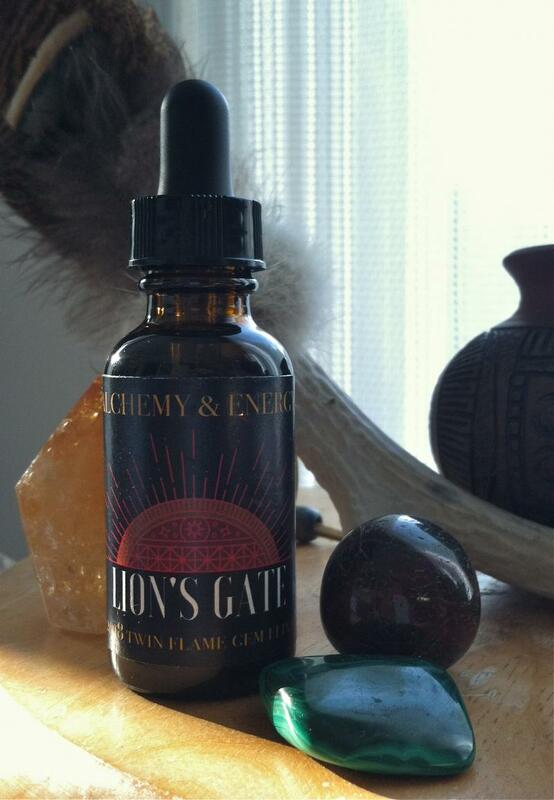 You can use 7 drops from your Alchemy & Energy Twin Flames Gem Elixirs Mother Essence elixir bottle for additional 1 oz. SB bottles. This creates a “softer experience” for some. 3-6 drops under the tongue for 10-20 seconds as you visualize and feel your manifesting intention as often as needed. One dropperful in your water bottle to sip throughout the day as a healing regime. Spray your pulse points and auric field for cleansing, purifying, strengthening & grounding. Crystal elixirs are powerful vibratory essences that affect the physical and etheric levels to shift and raise your vibration, to energetically release that which is not of your highest good, to heal certain issues, to rebalance you, and to awaken your Spiritual gifts and abilities. Their effects can be subtle or very intense. This depends on you and your chemistry. Experiment with them to see what works best for you! Every body is different, no claims are made on the exact effect the essence will have on any individual. Please note that this essence is not a substitute for medical treatment, nor is it a medicine. Nourishing our energetic bodies is as important as feeding our physical body. We eat three meals a day and supplement our diets with herbs and vitamins. Being exposed several times a day to a vibrational therapy could nourish our energy bodies. Exposure to vibrational therapy four times a day is like having a meal that provides strength and stamina to our physical body. Feelings of unwellness may be low energy, stress or unresolved emotions. The fact that you are stressed tells you that your electrical circuitry has been overloaded. Essences help to reconnect and stabilize the weakened electrical area while the body goes through the necessary healing process. The essences the support the body’s innate intelligence in repairing itself. Injuries such as bruises, sprains and swelling. An injury is an assault on every level of our being and our electrical circuits are then overloaded and the essence promotes the recovery and recuperation. Headache or a heavy feeling in the head. A headache is an indication and a message from the body that something is not balanced. Essences bring energy back into the system to allow the body to regenerate balance. Change in your life. Changes in your job, moving to a new home, change in relationships, a newborn coming home or a teenager leaving home are times of stress. Good changes or bad changes can charge our emotional field and overload the emotions. Essences help stabilize emotions through times of transition. Facing challenges such as a job interview, court case, important meeting, big exam or presentation, a contest or sporting competition. Vibrational Therapy will support and stabilize the body physically, emotionally, mentally, and spiritually. Therapeutic sessions where you are working on yourself for the purpose of making positive change, gaining understanding or improving your life on some level. Therapeutic sessions, by design stir the body physically and emotionally to effect change. Vibrational Therapy supports us as we move through and integrate the process, supporting the process after the therapy session when used at home. You can continue to balance at home so the following therapeutic sessions will become progressive.